12-story Montage Deer Valley opens Thursday and expects to be "sold-out for the holidays." Steve Griffin | The Salt Lake Tribune The lap pool in the Montage Deer Valley's indoor spa was designed to resemble the swimming pools at Hearst Castle on California's central coast. An open house today will precede the beginning of business Thursday at the Montage. 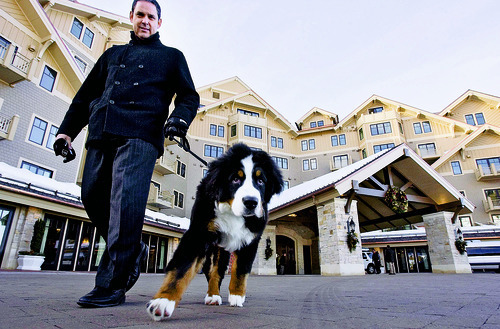 Steve Griffin | The Salt Lake Tribune Bob Arrivillaga, associate director of group sales at the Montage Deer Valley luxury hotel, takes a walk with his Bernese Mountain Dog Monty, the hotel's canine ambassador. Park City • Make it three luxury hotels to open in the Park City area since the 2002 Winter Olympics elevated the ski town's stature as a swanky getaway spot for the elite. Montage Deer Valley enters the market Wednesday with an 11:30 a.m. ribbon cutting, followed by an open house to give the Park City community a look at all the opulence the year-round resort has to offer. Business as usual begins Thursday at the hotel atop Marsac Avenue, adjacent to Deer Valley Resort's midmountain Empire Canyon Lodge  with Montage Hotels & Resorts founder and chief executive Alan Fuerstman saying, "We'll be sold-out for the holidays." Welcoming many of those guests will be Monty, a 1-year-old Bernese Mountain Dog, Montage's canine ambassador. While Monty touches the hearts of incoming visitors, valets will move their luggage into a lounge dominated by the sculpture of a 19th century miner/skier. Hallways with distressed hardwood floors lead to Montage's 154 guest rooms, which are rented in traditional hotel fashion, and 66 suites and residences, whose owners can put them into a rental pool administered by resort staff. Other halls lead to one of the resort's three restaurants, or its 17,000 square feet of indoor meeting space (an additional 33,000 square feet are available outside), or its 7,000-square-foot ski shop or its 35,000-square-foot spa, with treadmills facing bay windows overlooking the Park City valley. 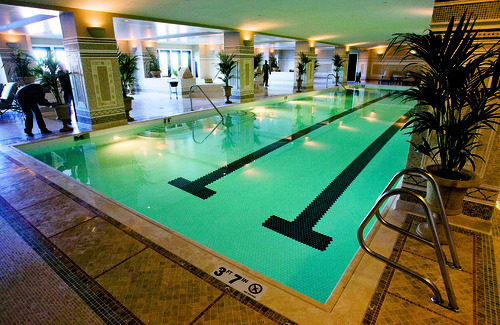 The spa also features a swimming pool whose architect patterned it after pools at California's glitzy Hearst Castle. Hallways and open areas are adorned with striking paintings of life in the West, from cowboy scenes created by Frederic Remington to portraits of birds obtained in a working agreement with the National Audubon Society, said Montage spokesman Dan Herbert. Fuerstman takes special pride in the prominent placements afforded paintings by Luke Frazier of Providence, one of many Utahns involved in various aspects of the resort's debut. Montage consciously sought to "become part of the greater Utah community, to being valued members of that community," he said. A large percentage of the resort's 500-plus staff members were hired after nine local job fairs. Beers sold inDaly's basement grill and lounge were developed in conjunction with Utah's own Wasatch brewers, boasting labels like Montage Mountain Ale. The resort even has its own local beekeeper, producing specialty honey goods that link visitors to Utah's heritage as the Beehive State. Fuerstman, whose first two Montage properties are in Laguna Beach and Beverly Hills, Calif., said Deer Valley was an ideal location for the resort's first mountain venture. "Nature treated us well. This is as good as any setting in North America … grand in many ways, intimate in others." This combination, he insists, will help Montage contribute to Park City's emergence as a global destination, an Olympic ambition that was advanced with last year's openings in Summit County of the St. Regis Deercrest and Waldorf-Astoria hotels. "The Olympics created an international awareness of the Park City market," Fuerstman says. "Having a cadre of great hotels in the market also helps."